On March 13, 2017, BlackRock announced that it would expect companies to provide assessments of how climate change would affect their business. BlackRock is the largest asset owner in the world—its US$5.1 trillion under management is equivalent to 4.3 percent of the world’s GDP—and this announcement confirmed an already strong trend of investor pressure around climate issues. When it comes to key business drivers, which include investors, consumers, employees, and markets, it’s clear that climate ambition is a growing requirement for companies. Here are four business driver trends that you should know as you explore how to implement climate strategies that support a low-carbon economy. 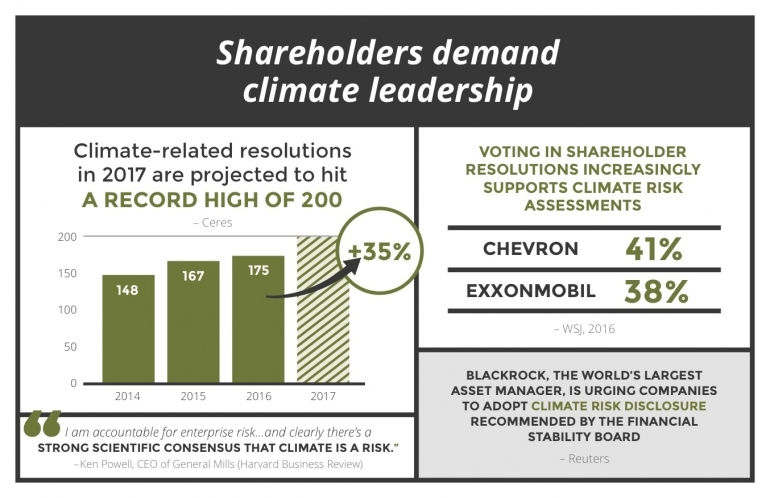 In 2016, shareholders filed 175 climate-related resolutions, up from 167 in 2016 and 148 in 2015, and resolutions are expected to exceed 200 this year. This trend is especially strong in the oil and gas sector, where shareholders at Exxon and Chevron, for instance, are formally recognizing climate change as a major risk. These resolutions, when accepted, demand that climate risk assessments are made available to investors. Since 2015, when 99 percent of shareholders voted for a special resolution, Shell has been required to report on operational emissions management and low-carbon energy R&D as part of its regular reporting. That same year, 98 percent of BP’s shareholders voted to have the company publish more information on a number of climate issues, including: whether the value of its oil and gas reserves would be damaged by limits on carbon emissions, its investments in low-carbon technology, the scale of carbon dioxide emissions from its operations, the linking of executive pay to greenhouse gas reduction, and its lobbying on climate change. Meanwhile, the Financial Stability Board will soon submit recommendations for climate-related financial disclosures to the G20 after a two-year consultative process. The aim is for companies across sectors and geographies to adopt the recommendations, which would allow investors to make better-informed investment decisions. Markets will continue to evolve in this direction as well, since, according to Morgan Stanley, 86 percent of millennials—broadly defined as those born between the early 1980s and 2000—say they are interested in socially responsible investing and are twice as likely to invest in a stock or a fund if social responsibility is part of the value-creation thesis. Pressure is coming from another key constituency: customers. As consumers seek to align their values with how they spend their money, brands can benefit from this growing trend. The Energy Star brand—represented by a logo on appliances that meet the program’s energy efficiency requirements—does wonders for participating companies. According to a survey, brand recognition of Energy Star is around 90 percent, and more than 45 percent of respondents said they had knowingly purchased an Energy Star product. The program, which was created by the U.S. government, is under threat in the current U.S. administration, but it seems that globally, the trend will continue: Consumers across sectors are willing to pay more for responsible products. 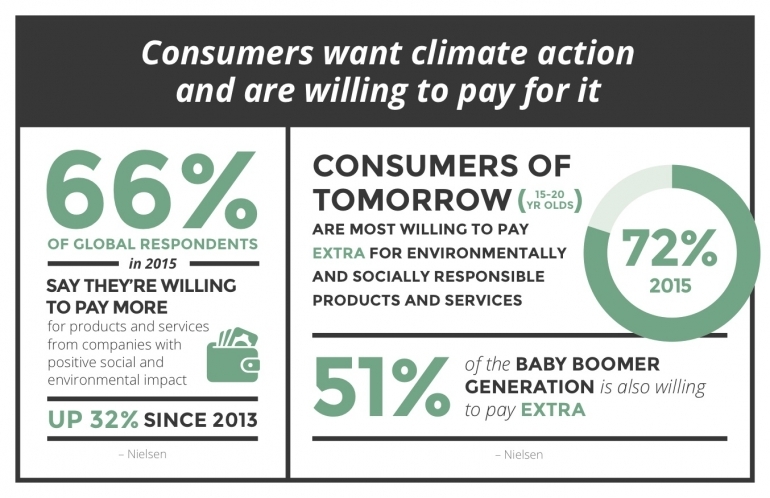 According to Nielsen, 58 percent of consumers would pay a premium to an environmentally friendly brand, and this figure climbs to 72 percent among the consumers of tomorrow, who are currently between the ages of 15 and 20. More than half of the workforce will consist of millennials in 2020, 3 out of 4 millennials accept that climate change is a fact, and 87 percent of them measure the success of a company based on standards that extend beyond financial measures to include social and environmental performance. 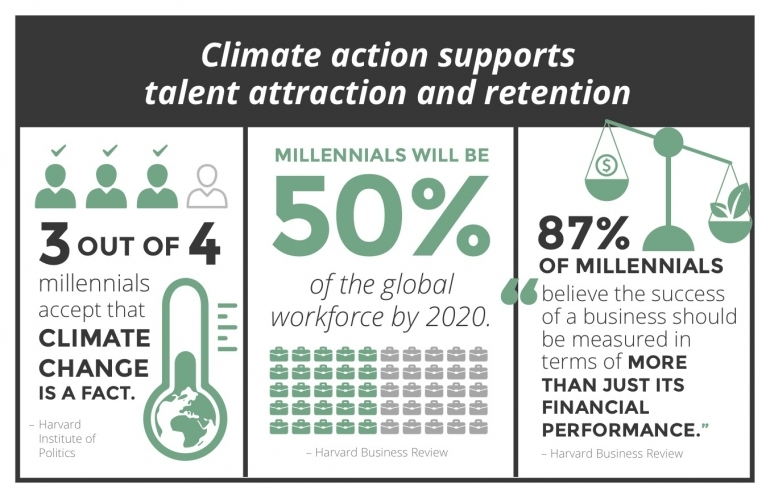 Therefore, it’s a simple fact that companies that wish to attract and retain top talent will need to make sure they are addressing climate change appropriately. What is more, one-fifth of students from top business schools in the United States refuse to work for a company that has bad environmental practices, which means the talent pool for companies that do not address climate change is not only shrinking—its quality is lessening. Some companies have taken proactive measures to respond to external pressures from markets through low-carbon innovation. Automakers are significantly investing in green technologies in their R&D budgets, and the electric vehicle market has grown by more than 50 percent in the past 4 years globally. Ford has committed to invest US$4.5 billion in electric vehicles by 2020, and Daimler has committed US$11 billion until 2025, when it aims to come out with 10 electric passenger vehicles. In parallel, companies investing in energy storage are bringing down the cost of batteries. 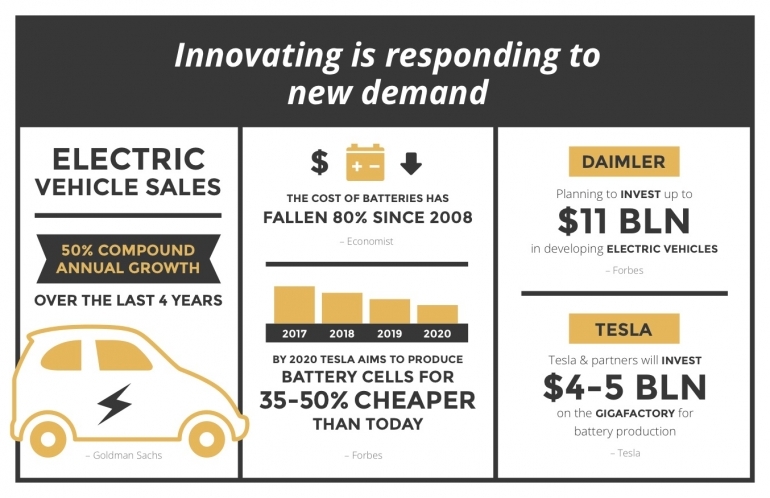 Since 2008, the cost of batteries has already fallen 80 percent, and Tesla and partners’ multibillion-dollar research investment aims for batteries in 2020 that are 35-50 percent cheaper than current ones. Not only are these companies accelerating the shift to a climate-compatible economy, they are disrupting markets, taking the lead in innovation, and responding to growing demand from consumers. Combined, these key drivers make a strong business case for climate action. Companies that integrate these trends into strategic decision-making are likely to capture opportunities with investors, consumers, and employees, while reaping the benefits of innovation. No longer an add-on to business strategy, climate action is rapidly becoming one of its pillars.